The system gradually emerged during the African odysey project (launched 1995, http://www.rozhlas.cz/odysea/angl ), which tracked black storks (Ciconia nigra) on their autumn migration from Europe and then on their wintering grounds in sub-Saharan Africa. The system was first used to directly monitor free-flying Houbara bustards (Chlamydotis undulata) in 1999 in Morocco (Peske 2000). Designed for a laptop with mono sound card input. PTT signal can be recognized, selected and analyzed even if it barely exceeds background noise. Strong signals must be attenuated because they are up-limited either in the receiver (above) or in the audio card (below). Note good front-to-back ratio typical for H antennas, clear maximum and side minima. Flags (always "up") enable geographical orientation. Rotating connector - crucial element ?HOW TO MAKE IT? 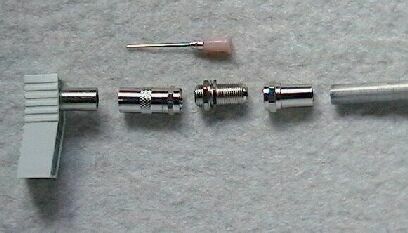 Commertially available connectors are difficult to find and expensive. This combination of commonly available F-couplings is an effective substitution. Mixer of signals for a mono-input of laptop. ?HOW TO MAKE IT? With this simple double-emplifier one can hear PTT messages and balance levels of flags (serial condensers) and PTT audio signals (pot). This antenna has excellent operational parameters: small size, good gain and front-to-back ratio. It is directional even if dimensions are far from theoretically ideal.